I told my dentist I was finally ready to close my tooth gap. My dentist has been after me to do it all year. But, I assumed we’d do braces to close it. That’s one of the things which took me so long. I wasn’t too excited about that idea. But, I’ve finally decided that I’d rather have some temporary embarrassment instead of permanent embarrassment. But, when I told him, he suggested something called Lumineers. He explained it to me and it seems like a huge overtreatment and expense for a tooth gap. Should I just go to an orthodontist or is this the new standard? I am glad you wrote before going through with this. It sounds to me like your dentist is an inexperienced cosmetic dentist trying to gain some. He’s using your tooth gap as an excuse to practice. Lumineers are a brand of porcelain veneers often marketed to inexperienced cosmetic dentists as being easy to place. Even if he weren’t trying to gain experience, porcelain veneers are not the standard treatment for a tooth gap, unless the patient wanted a total smile makeover. Now, if you wanted to completely change your smile then that would be fine. But, that’s not what you’re after. You simply want to close your gap. I have great news for you in that regard. There are two fantastic options for you to close that gap which not only are much less expensive than Lumineers, but you won’t have to wear any metal braces. There’s a new kid on the block when it comes to orthodontics these days. 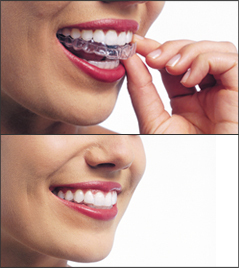 Invisalign uses clear aligners to straighten your teeth. They’re much more comfortable than traditional braces and often work in half the time. This will allow you to straighten your teeth without anyone knowing. There are no restrictions on what food you can eat. Plus, because they’re removable, you’ll brush and floss normally without the challenges that come from a mouth full of metal wires and brackets. Depending on the size of the gap you’re talking about, a good cosmetic dentist (not necessarily your family dentist) can close the gap using a composite resin. He or she can shape it to blend in perfectly with your natural tooth structure. This is also a great solution for minor chips on your teeth. The only thing to be aware of with bonding is that once it’s on the color can’t be changed, so if you plan on ever whitening your teeth do it before the bonding is done. I’d do either of those two procedures before Lumineers. Will an Emergency Dentist Charge the Cause of the Accident? I was at a stag party. We were at a pub when one of the group got a little too drunk. He started trouble which ended up causing a fight. The result of which was my front tooth lost a piece and is now loose. I’m assuming I need an emergency dentist, but I’m broke. Will the dentist charge the fee to the moron who started all this? I’m very sorry this happened to you. It’s hard when you’re trying to be responsible and the people around you cause problems. You’re right that this needs an emergency dentist. Your loose tooth needs to be splinted to stabilize it. There are several ways a dentist can do this. What method he or she uses will depend on what other issues your tooth is facing. He’ll also want to examine it for trauma to the nerves or pulp. Internal damage could mean a root canal treatment and possible crown. Once the tooth is secure, if there’s no other damage you can fix the broken piece with dental bonding. You don’t have to have the piece that broke. A skilled cosmetic dentist can sculpt a composite resin onto your tooth which will look just like your natural tooth structure and blend in perfectly. Who Pays for Emergency Dental Care? Unless the person responsible comes and agrees to pay for treatment, the dentist can’t bill him. He can only bill the person receiving the services or their legal guardian without prior approval. However, you can ask for a detailed bill of the damage and send the bill to the offender. If he has integrity he may just pay. If he doesn’t, you may have to take him to small claims court. Just be aware, many dentists are willing to work with patients financially, especially those in emergency situations. Just talk to the dentist ahead of time. If he’s not willing to work with you, try Care Credit, though most dentists offer that in-office. It’s a medical credit card that has low and even no-interest payments. I’m not sure if you can help me but I’ll try anyway. I had bonding done on a front tooth that was chipped. That chip wasn’t that big. It kind of worn out after quite a few years. My new dentist said it can’t be replaced and I’ll need to have a dental crown placed. I wasn’t keen on that. Like I said, it’s just a small chip. Instead, we compromised on a porcelain veneer, but when he put it on it was crooked. Now he says because it’s bonded there’s nothing I can do about it. Is he right? I can’t go around with a crooked front tooth. I’m concerned about the quality or honesty of the dentist you’re going to. First, there was no reason why he couldn’t have re-bonded your tooth. I have no idea why he told you that unless there’s something else going on that you haven’t mentioned. This is one reason I am questioning his honesty. I’m thrilled you decided not to get a dental crown for the tooth. That would have been a massive overtreatment, costing you healthy tooth structure. I understand why you compromised on a porcelain veneer, which is a little better. However, it’s obvious your dentist didn’t have the skill or it would not have been improperly bonded. At the very least, without replacing it, he should have offered you a refund. it’s unbelievable to me he’s expecting you to go about with a crooked veneer. In fact, it’s unethical. This doesn’t meet the minimum standards of treatment. At some point, because of how it’s placed, it will break off. Who Should Do Your Porcelain Veneer? You’re in a bind now. Here’s what I’d recommend. Go to a good cosmetic dentist and have them give a second opinion. I’m pretty sure they would tell your dentist it’s unsatisfactory. A dentist will sometimes listen to a peer where they wouldn’t listen to a patient. They’ll give you a refund so as to not look bad. Then, you can go to another dentist to have it replaced. Finding an expert cosmetic dentist is a matter of knowing what resources to find. First, look for a dentist accredited with the American Academy of Cosmetic Dentistry (AACD). If you live in an area where there isn’t one within a reasonable drive, your next step is to look on the mynewsmile.com website. They recommend highly qualified and artistic cosmetic dentists by area. You’ll be safe getting a dentist who can give you a great veneer. In fact, they’ll give you a gorgeous smile. Are Tooth Bands A Good Alternative to Porcelain Veneers? I have a tooth gap that I told my dentist I wanted to fix. He suggested braces, but I wasn’t keen on wearing metal on my mouth. Then he suggested porclain veneers. I liked the idea, but they are so expensive. I recently saw an add for tooth bands that close gaps. Is that a good alternative? Unfortunately, tooth bands are a gimick that could actually end up costing you your teeth. While they will pull the gap closed, they do it by loosening and tipping your teeth. Orthodontics, move the teeth in proper stages AND give the surrounding bone time to reform around the roots. I do have good news for you though. If you don’t like the expensive of porcelain veneers, there are other ways to repair your gap. If you want to close the gap, without metal braces, you could get Invisalign. These use clear aligners, that are not visible to others when they’re on your teeth. If you don’t want any orthodontics, but just immediately want to close the gap, then dental bonding can do that, at a fraction of the cost of porcelain veneers. I’m actually surprised your dentist suggested veneers before bonding. Are orthobands good enough if you can’t afford porcelain veneers? My dentist wants me to get orthodontics to close my tooth gap. I told him I’m not interested in doing braces because of the time involved. His next suggestion was using porcelain veneers, but that was way more money than I’m willing to spend. I read about orthobands. Would they work? I would absolutely NOT recommend ortho bands. They’re nothing more than regular rubber bands that force your teeth together. The problem is they only move your teeth, not the roots, which puts you in danger of loosing your teeth as a result. I’m surprised your dentist didn’t recommend dental bonding to fix your tooth gap. That is the general treatment for that type of situation. It’s much more affordable than porcelain veneers. That will be a good option for you if all you’re looking for is to close the gap. However, if there were other things about your smile that you were hoping to change, such as their shape or color, then porcelain veneers would be the best option. I’m puzzled why that is what your dentist suggested if the gap is the only issue. Is there more to this than you’ve mentioned? Why won’t my dentist fix my teeth? I have teeth that need some work. Some are just discolored. Others are chipped, and some have decay. All my dentist wants to do is remove the teeth and repalce them with partial dentures. I told him if I did replace them I’d want something more permanent, not something removable. He said my teeth can only have partials. I keep hearing about all these advances in dentistry, like dental implants. How do you get those. Also, isn’t there a way to save my teeth? The sad truth is, just like with any other field of study, dentists vary in their abilities as well. Sometimes skill is the only factor, sometimes it’s laziness. Some dentists are passionate about saving teeth. Others are fine just removing them. Your chipped and discolored teeth can easily be repaired with dental bonding and whitening. Your decayed teeth may still be able to be saved as well, but if not there are better treatments than partial dentures. You’re right that dental implants would be a much better treatment. However, it sounds to me like your dentist doesn’t know how to do theses procedures. My suggestion would be to get a second opinion from a different dentist to get the kind of care you want. Will Porcelain Veneers Fix a Tooth Gap? If I have a gap between my two front teeth will porcelain veneers fix that? The short answer is yes. However, if the gap is very large, you may want to look at other options. Otherwise it could look unnatural. If it’s not a huge gap, then yes, porcelain veneers can give you a very attractive, natural looking solution. There is also a less expensive solution. 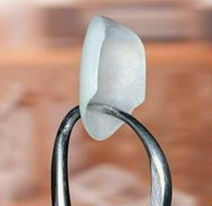 A common solution for a tooth gap, is to use dental bonding. That’s a composite resin that your dentist will shape to close the gap and blend into your natural teeth. If the only issue you have with your smile is the gap, then I’d use dental bonding. If, however, there are other things you’d like to fix about your teeth, such as their color, shape, or size, then porcelain veneers will be a much better solution. The key on any of these, though, is to get a very good, artistic cosmetic dentist. Ideally, you’ll want to get a dentist that is accredited with the American Academy of Cosmetic Dentistry (AACD). This blog is brought to you by Cosmetic Dentist Dr. Randall Burba. I love my mom. She is probably the most genuine, kind-hearted woman on the face of the earth. Unfortunately, that makes her kind of a target. Her dentist, who by all accounts is a great family dentist is trying to talk her into a very expensive cosmetic procedure–Lumineers. He says they’re so easy any dentist can place them. Her teeth are discolored, mostly due to age and her front tooth is chipped. Will you tell my mother what she needs for this is a cosmetic dentist? Please?! There’s nothing more valuable in the world than a kind-hearted mother. Their tenderness makes life more joyful. You’re right that your mother needs a cosmetic dentist. What you may not realize, though, is there isn’t a recognized specialy in cosmetic dentistry. Therefore any general (family) dentist can alos be a cosmetic dentist. All they have to do is learn the procedures. So, how do you find the best dentist for the best mom? Before your mother starts kindly telling you, “I told you so,” I am apt to say her current family dentist doesn’t qualify&mdash;for a couple of reasons. 1. Lumineers. His boast that lumineers are so easy to place that anyone can do it has me very nervous as to what kind of smile she’d have ended up with. He’s right about one thing, getting certified to place lumineers is easily done. They simpley pass a written exam that is designed to see if they get the concepts. So, in that case, her dentist is right. Any dentist can pass that test. They’re marketed to family dentists who want to cash in on the surge of interest in cosmetic procedures. They are ultra thin. The benefit to dentists is that little tooth prep is required because of that (though I will say it should be). Without it, though, they can look bulky. Unfortunately, that isn’t the hard part about Lumineers (or any other brand of porcelain veneers). The hard part is the artistry. That takes years of study and practical training. 2. The choice of procedure. Yes, Lumineers can fix chipped and discolored teeth, but it is a very expensive way to do so. If that is all that bothers your mom about her smile, than teeth whitening followed by dental bonding to repair the chips is a MUCH less expensive route to go. However, if there were other thing that have always bugged or nagged at her about her smile, then porcelain veneers are a great tool to get a complete smile makeover. In fact, she can get a drop dead gorgeous smile. In that case, it is a matter of finding that best cosmetic dentist in your area. Ideally, you want a dentist who is accredited with the American Academy of Cosmetic Dentistry (AACD). They are the top, most artistic cosmetic dentists in the world. You want accredited…not just a member. Membership can be attained by any dentist. Accreditation requires serious skill and artistry.